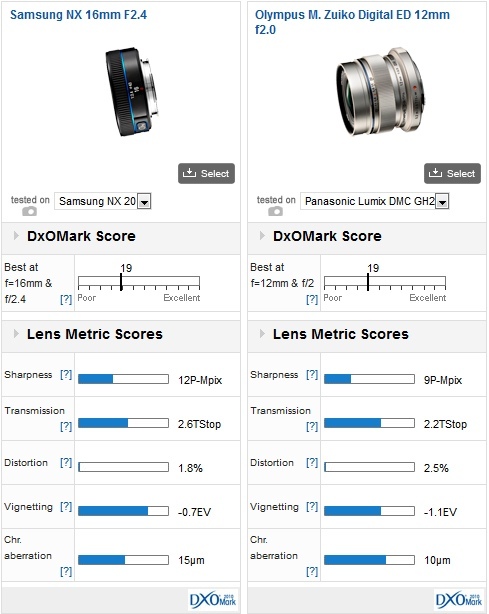 Samsung NX prime lens reviews: five models measured! Samsung adopted the APS-C format sensor for its range of mirrorless cameras and although the system is still in its infancy the firm has responded to user requests for ultra-compact lenses; of the seven fixed focal lengths in their range, three are so-called ‘pancake’ prime lenses. In complete contrast, the maker also has some specialist lenses in the range used to showcase Samsung’s considerable technical expertise with ultrasonic type AF motors, ED glass types and optical image stabilization. One unique feature to Samsung and common to each of the lenses in the range is the innovative “I-Function” button. Located on the side of the barrel, the button allows the user to cycle through options such as shutter speed, ISO and aperture values, making selections using the focusing ring (or a separate collar in the case of the larger lenses). Achieving a high DxOMark Score of 23 points, the best-performing NX mount lens in our database is the high-end, ultrasonic AF motor equipped NX 85mm f/1.4 ED SSA. 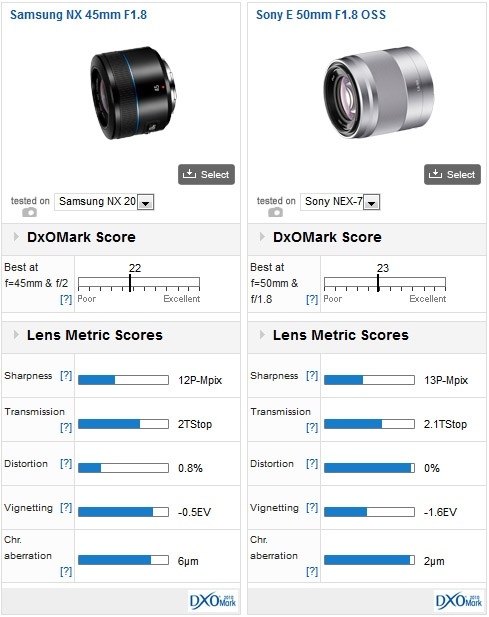 That model and the NX 30mm f/2 pancake are the sharpest tested (both scoring 14P-Mpix). Note that while the moderate 45mm telephoto is ranked second, the Sharpness score lagged a little behind those models with 12P-Mpix score (please see below). Against the recently tested Sony NEX mount equivalent (and best performing model in their range) the Samsung NX 45mm f/1.8 compares quite well. While the Sony scores an additional 1P-Mpix in Sharpness, it’s not really surprising given the extra pixel count of the Sony NEX-7. Nevertheless, the Sony has more consistent sharpness across the field and less noticeable distortion and lower chromatic aberration. Given the $300 sticker and built-in stabilisation of the Sony, the $350 wanted for the Samsung makes it look a little on the expensive side. On the whole pancake lenses don’t usually stand out for high-image quality though new designs made specifically for digital cameras seem to be bucking that trend. This high-speed lens has the equivalent angle of view to an appealing 45mm (in 35mm format) and performs very well. 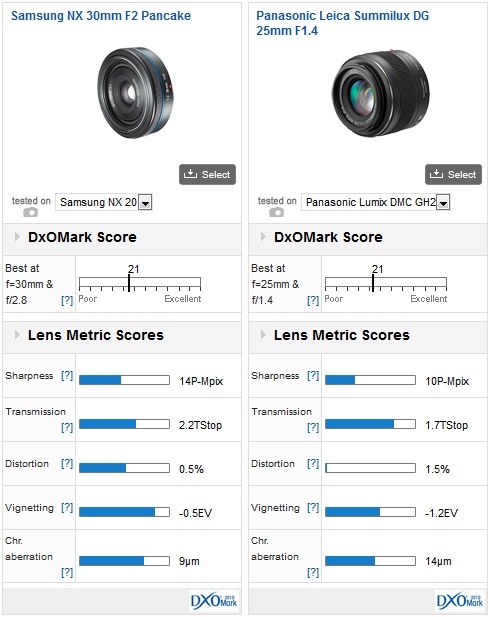 The additional 4P-Mpix over the conventional design of the Panasonic Leica Summilux DG 25mm f/1.4 is encouraging despite the extra pixel count of the NX20 over the GH2. 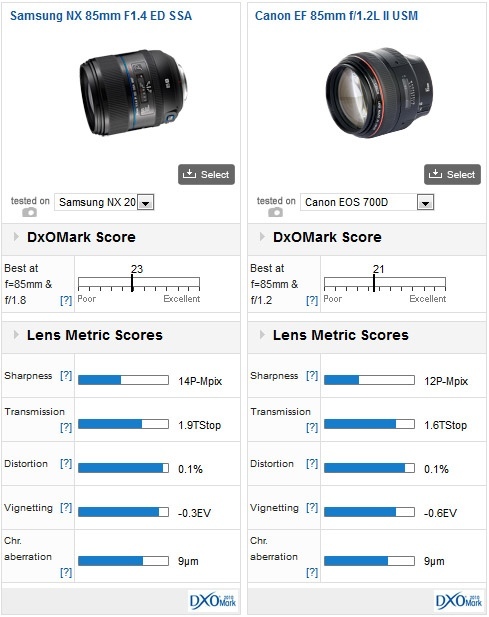 This strongly suggests superior sharpness but if we look at the field maps we’ll see the Samsung’s sharpness advantage is in the centre of the field. Elsewhere, the Samsung is well corrected but bear in mind the Panasonic made Leica lens is 2/3 stop faster at full aperture and therefore a good deal more expensive. For all that, the Samsung is appealing for its compact dimensions and, at $279, more accessible sticker price. At first sight these two appear incongruous but with an angle of view equivalent to a 24mm (on a 35mm full frame model, the Samsung NX 16mm f/2.4 is not dissimilar to the Olympus 12mm, however there the similarities end. The Olympus is ½ stop faster at full aperture or thereabouts and is a high-grade model featuring ED glass elements in a sturdy aluminium shell. Be that as it may, the Samsung nudges ahead in sharpness and even has lower levels of distortion and vignetting (though again the large aperture design of the Olympus plays a part here). Only the high levels of lateral chromatic aberration, and a $300-350 sticker, somewhat dampen what would otherwise be an excellent performance. Comparing the dedicated 60mm f/2.8 Macro (a image stabilized model, equipped with ED glass and an ultrasonic-type AF motor) with the similarly stabilised Panasonic Leica DG Macro-Elmarit 45mm f/2.8 ASPH OIS on the Lumix GH-2, the Samsung is no slouch. The Samsung pair are capable of higher sharpness (as one would hope) but, equally, the scores for transmission, vignetting and distortion are all excellent. The only pause for thought is the rather high Chromatic Aberration but at $499 compared with nearly $900 for the Panasonic Leica equivalent, the Samsung 60mm appears underappreciated. Although it might seem like a full-frame lens, on the Samsung NX cameras the $899 NX 85mm f/1.4 ED SSA is the equivalent to a 127mm – a little long for indoor portraits. However, this well specified lens is interesting when compared with the $2,199 Canon EF 85mm f/1.2L II USM, especially when that model is paired with an APS-C camera (albeit with a slightly physically smaller sensor than the Samsung’s). Pixel counts between the two cameras aren’t identical either so the Samsung has the advantage there but in other respects the image quality is very close with similar characteristics (and scores) for transmission, distortion and CA. Given the price, the Samsung is a steal. Although Samsung’s mirrorless system doesn’t quite have the same reputation nor heritage as its more established rivals, the lens range (while admittedly containing some oddities, such as the 85mm f/1.4 and the not tested 45mm f/1.8 2D/3D model) is refreshingly innovative and are, mostly, very strong performers. 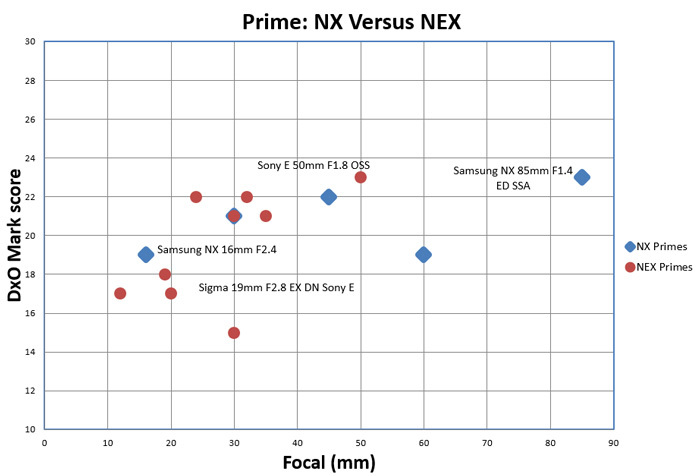 In fact, as our comparison graph (above) shows the NX mount primes compare very favourably with the equivalent NEX mount lenses from Sony. 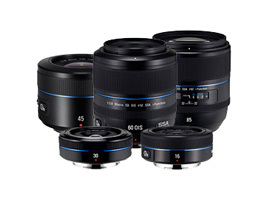 But it’s not only the NEX mount lenses that the Samsung models compete with. They’ve shown with the 85mm f/1.4 and some excellent sensors what they’re capable of, but perhaps what’s needed now is a high-end enthusiasts model to contend with the likes of the OMD-EM5, GH-3 and NEX-7.